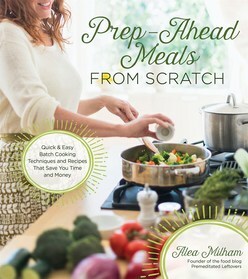 Prep-Ahead Meals From Scratch will save readers time and money by teaching them how to prepare large batches of different staples to quickly combine into a variety of meals in no time. The book offers batch cooking for beef, chicken, pork, beans and rice. Plus you can batch cook however you like, whether that's on the stove top, in the oven, in the slow cooker or in the broiler. Each cooking technique comes with incredible recipes such as Mongolian Beef Lettuce Wraps, Chicken Alfredo Skillet with Spring Vegetables, Pulled Pork Stuffed Sweet Potatoes and Artichoke and Spinach Rice Bake. By batch cooking, readers can prepare multiple family-friendly meals at once, ultimately saving time and money. Prep-Ahead Meals From Scratch sets out to redefine "fast food," offer speedy food prep techniques, share money saving shopping strategies and food storage tips and help readers pull it all together by learning to develop meal plans. Preparing meals ahead of time means you don't have to spend precious hours of everyday working in the kitchen, a big feat for those of us cooking for our families. Easy, make ahead meals your family will love using a mix and match system where you make batches of ingredients and then easily and quickly combine them into the meals you want when you want them.